Ruthie, everything is so beautiful. You look beautiful in your new clothes. Congratulations on a job well done. I love the pin, too. Probably won't be a SWAP piece but have just finished some teal knit trousers, the sort for lounging or PJs. New Look 6216 with the pockets omitted. I managed to cut the front and neckband for this top out of the remnant left from the cardigan. I might include this in the SWAP as it looks quite nice. I placed the strong turquoise motif at the front neck. 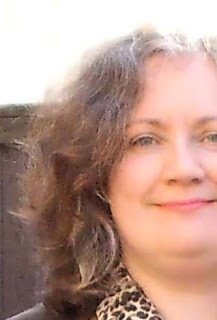 The neckband came from what was left. The sleeves and back are from a dark teal plain knit. This is the scoop neck top from New Look 6735 with the sleeves lengthened slightly. So I now have 7 teal pieces sewn which has caught me slightly by suprise, though in a good way. I have a teal lined skirt cut out but no sewing has begun yet! So that's my next project I think. I've got three things in progress, the teal lined skirt, a scrap pouf (https://closetcasepatterns.com/fabric-floor-pouf-free-sewing-pattern/) and a red and black jacket for the PR Sewing Bee round 2 (where it feels like I've bitten off too much!). They all use different colour thread so I can't really switch between them. The jacket has a lot of pieces and includes techniques I've not done before. It also doesn't work with my SWAP colours/inspiration at all. Being me I had planned (on paper) a whole 6PAC around the jacket, and was going to return to the fabric shop for more yardage to execute it, but I think instead I might mix the project scraps with plain red and plain black already in the stash. Or it may be that once I've finished the jacket I can't bear that colourway anymore and switch to the navy part of my SWAP. (Black and red is a bit strong for my colouring, so will need red lipstick when worn). Zipper challenge for PR sewing bee completed but not suitable for SWAP unfortunately. Wow! Ruthie...this looks so creative and just flat out terrific. I bet you will get a lot of wear out of it. Oops. Sorry. Was so taken with your jacket I just posted here instead of in the main swap discussion thread. I think I'm going to thread up in navy next and make a New Look 6735 ink knit top, see how far that colourway goes. I have got a partly assembled teal skirt though, so maybe should revisit that first? My next project is underway and it is in the INK colourway. This could be imagined I suppose as navy blue but its got a slightly teal edge to it and is very dark. 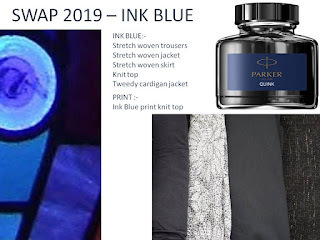 It reminds me of the colour of the Blue-Black Parker Quink Ink in bottles we used for our fountain pens at secondary school in the early 1980s. 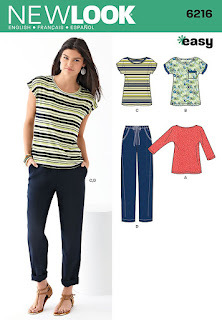 I am currently working on the INK knit top which is New Look 6735, the only pattern I have loved so much I have bought it twice at full price. INK is about as bad as sewing black on dark winter evenings and presumably will photograph like black as well, but I'll still share it. P.S. 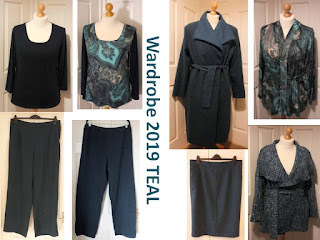 I did not pass through into Round 3 of the PR Sewing Bee but that's cool (if slightly disappointing) as it lets me go back to sewing up my SWAP plans. 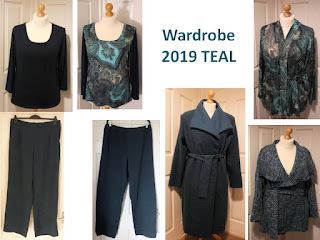 I went back to the teal knit trousers and altered them by removing the waistband casing, cutting off the excess and reattaching it. That has worked well and they are now more wearable (if still very very casual). I have also continued with the teal lined skirt as it was bugging me having an unfinished project. I don't tend to wear skirts much, but having cut it out and sorted the pockets it makes sense to finish it. Perhaps being nicely lined and having pockets will encourage me to wear it. In the teal colourway I also have a planned knit top, but it has a pale background so will come later. 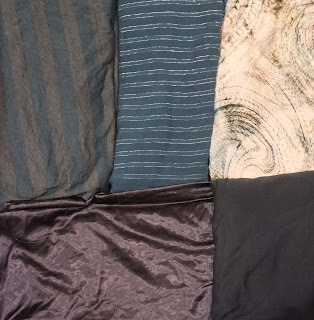 And I've found the rest of the fabric I used for the scarf for last year's SWAP and could make a wrap blouse or other top from this. 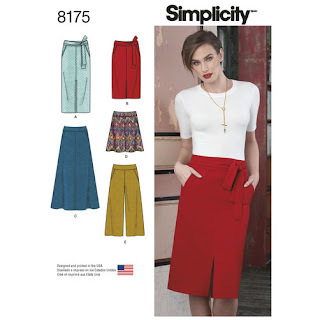 I used Simplicity 8175 as the starting point for my skirt, but its not an accurate review of the pattern. I had some fabric left from cutting out the Burda Teal trousers which looked very skirt shaped to me. Of course there was not enough to fully cut this pattern with its curved waistband and so on so this is what I did. Used the main front and back pieces, but cut the front on the fold and added at the upper edge where the deep shaped waistband would be (removing seam allowance of course). Marked darts to go back to the original shape. 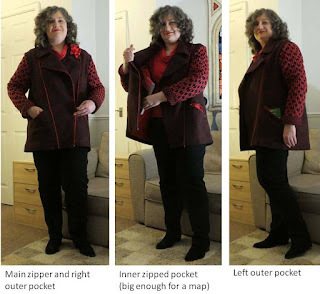 Used the pockets from New Look 6216 (which are one piece) which I cut from lining and then added a strip of teal fabric just for the pocket opening (stitched on top). Added a full lining, moved the split to the back as I had cut the front on the fold. Cut a narrow straight waistband, which I did need to piece at the end for the underlap. Invisible zip inserted at the back between the skirt and lining, and a button and buttonhole on the new waistband. Omitted the tie belt. It is now a very classic lined skirt, though in a midi length. I started this a couple of weeks ago and it was interrupted by the PR Sewing Bee, so good to have got back to it and got it finished. I also went back and altered the teal knit trousers by removing the waistband, cutting off excess length and reattaching waistband. These fit better now but are still very casual. Here's all the teal pieces (so far? ), though they won't all make it into the SWAP. Just realised that if I do three more dark teal pieces I would have a whole 11 piece collection just in teal. I can't resist!! 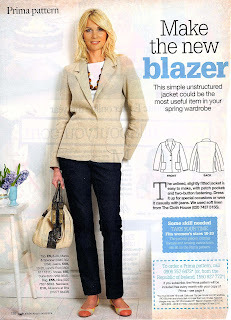 For a long time I subscribed to the UK women's magazine Prima as it had a free sewing pattern included. These are often simple to sew and many have a Kibbe Natural vibe to them. Although I ceased my subscription last year I still have a back catalogue to access. The patterns are printed on both sides of a single sheet of newspaper but don't overlap so are easier to trace than Burda. They are normally sized for 10-20. 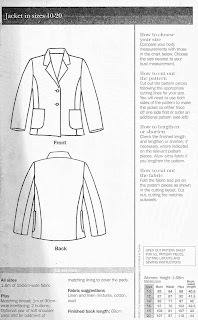 A short set of instructions (with pictures) and a layout diagram are also printed on the pattern paper (sometimes inside a pattern piece). 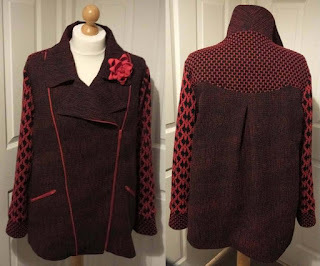 This would be a step up from my simple cardigan jackets without being too complex, so I am going to give it a try. I'm impressed that it has a two piece sleeve and seprate pattern piece for the undercollar. Today I traced off the pattern, and got the fabric out, but that's as far as I have got so far. So I stopped with the blazer half done and made a costume for a friend. Then I did some mending/small projects, and now I'm testing a pencil case pattern. Maybe my desire to sew for SWAP will return before the deadline..... who knows. I made 3 (complicated) pencil cases, some lavender bags and a whole load of pattern weights, and a dress for my Aunt. There is now navy thread on the machines (from Aunt's dress) so I might go back to my ink colourway for SWAP, I have a half done jacket and no ink bottoms yet. OK I have laid out some ink stretch lace on the dining table which I plan will be a top. The sleeves will be unlined, but I'll line the body section. I would work on the jacket next but seem to have misplaced the sleeves in my tidy up. I had assembled them already (2 piece sleeve) so not too hard to insert them. Then I want some ink bottoms - skirt and/or trousers. Jacket sleeves located, but by that point I'd already cut out the next item which is an ink lace top. It is partly constructed but I'm feeling rather weary, so maybe something for tomorrow. I am impressed! I wish I were on your Christmas list! This piece is made from a stretch lace with a plain knit lining to the body only. 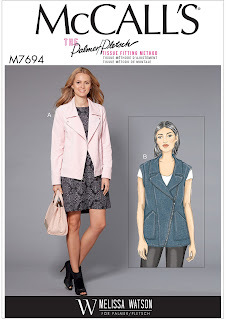 Its made from my favourite pattern New Look 6735. I've used the direction with the greatest stretch going around the body, which was actually lengthwise on the fabric. So the hems are the selvedge. - basted lace and lining together around the armhole and inserted the sleeve flat. - basted lace and lining together at each side, then basted the side seams and sleeve seam. - once confirmed OK, stitched and overlocked, threading overlock ends back into the seams. - the knit lining has a high cotton content so should be nice to wear, it is left unhemmed and slightly shorter than the lace.